About 5 years ago (where has the time gone?!) 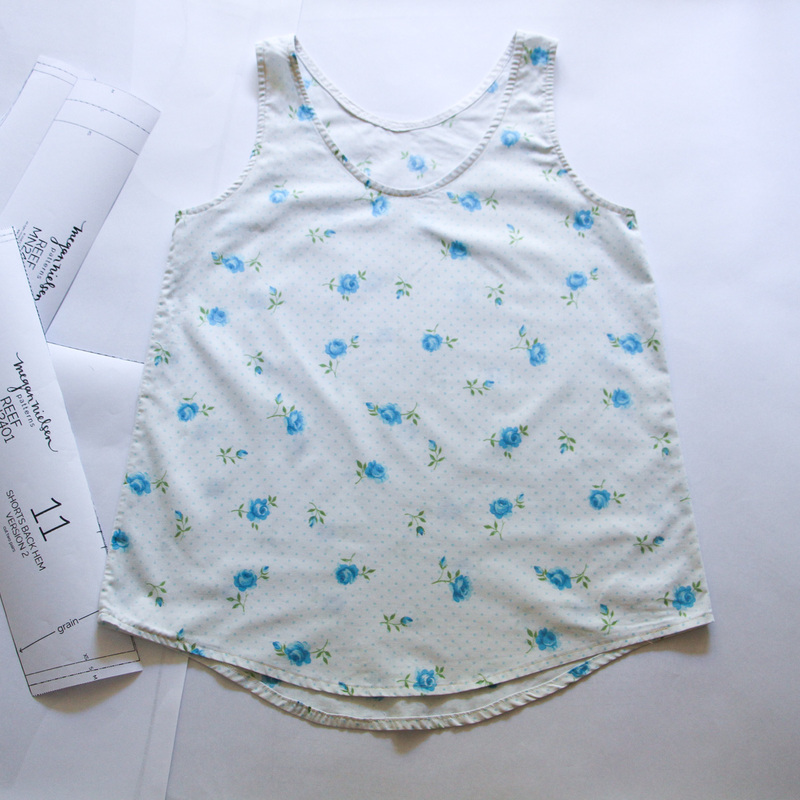 I blogged about making a Eucalypt pajama top from a thrifted sheet. It’s been one of my favourite PJ tops for the last few years, but it’s always bothered me that I didn’t have matching bottoms. The problem was that I had used that sheet for a number of other projects in the meantime, and had precious little of it left. So in January i decided I had had enough of mismatched pajamas, and was determined to make a matching pair of PJ bottoms. Obviously I discovered immediately the same problem scarcity problem i’d had before. 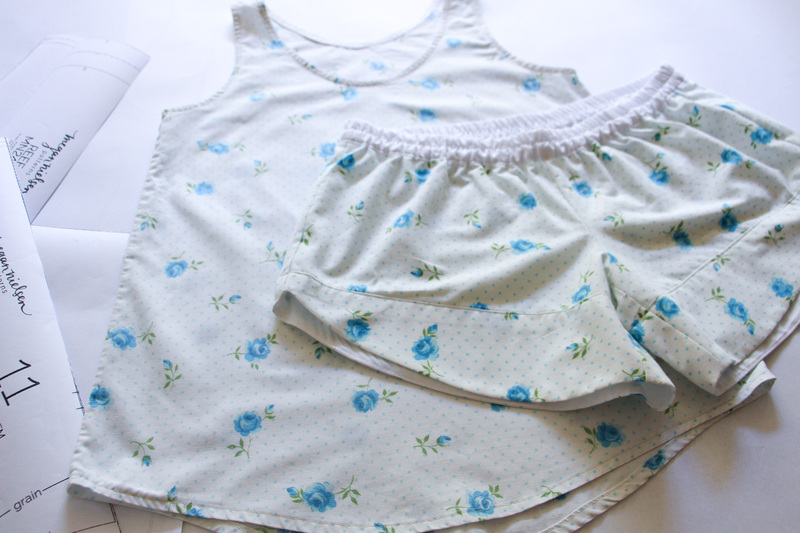 But thankfully since then I had designed my Reef pajama set, and that set includes a pair of low rise shorts with curved hems, which meant that even though there wasn’t enough fabric to cut big panels, there was definitely enough to piece together. 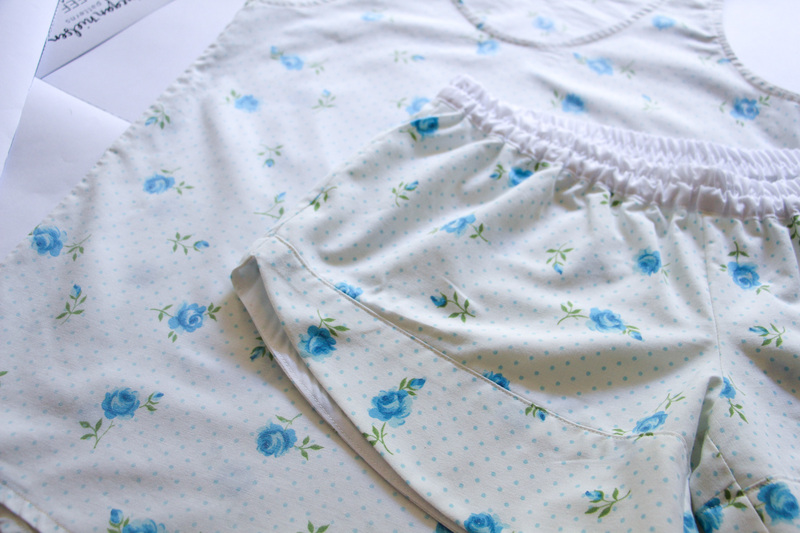 I also managed to save fabric by making the waistband and hem facings from plain white cotton that I had in my stash. Even though it was a fabric economy choice, I actually really like the visual break of the white waistband and hem facings given how many flowers are all over this set. I really love matching pajama sets, and I am so happy to finally have a complete set now! I really love how the Eucalypt top and Reef shorts work so well together. I feel even better about the fact that this whole set was made from a thrifted sheet and leftover bits of cotton from my stash. It’s pretty but also highly economical! 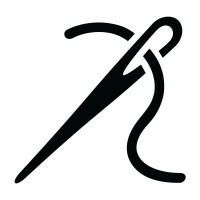 Usually when I sew I shudder at the thought of adding up how much money i spent on fabric and notions (not even counting pattern costs and sewing time). But this time I think I can safely say I spent less than $5 on this whole set (excluding labour and pattern costs). And even though my cost counting is highly selective and hypocritcal, it still feels pretty good haha. I’m going to enjoy this moment… until the next time i spend an inordinate amount on Liberty of London. This has inspired me to sew some matching pjs for my hols. Just ordered the reef shorts and cami pattern. I’m also planning the cami top as a partner to my flint culottes and I’m wondering if I can adapt the reef shorts into summer running shorts.